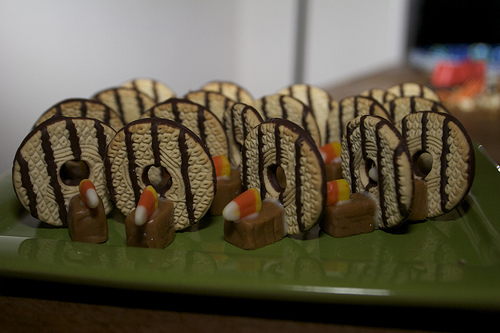 Here is a cute easy cookie that doesn't even require you to turn on the oven! They are a real time saver and everyone will love them! Begin by unwrapping the caramels. "Glue" each caramel onto the cookie as shown with the frosting. Finally, glue one piece of candy corn on top of the caramel. Stand your turkeys on a platter and serve!